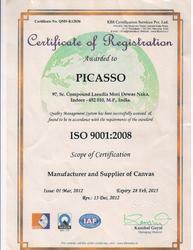 Established in the year 1988, we, “PICASSO”, an ISO 9001:2008 certified firm, are a renowned manufacturer, supplier and exporter of superior quality Canvas Products and Wooden Easels. 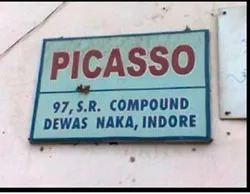 Some of range includes Canvas Products, Wooden Easels and Art Accessories. Reliability, cost-effectiveness, usability and high quality of our products is exemplary of the efforts we devote in production of a flawless range. Our products meet the varied requirements and demands of artists, students and professionals in schools, offices, hotels, and art galleries. Our quality control department, advanced R&D, large product line, and production facilities enable us to meet the various needs and demands of our clients'. Our robust infrastructure helps us to improve the production capacity and customize the product line as per the specifications provided by our clients'. For timely delivery of our products, we use transportation by road. Clients appreciate us for adopting hassle-free and easy modes of payments. Under the able guidance of our mentor, 'Mr. Johnson P. J. ', we have had a humble start and since then, we have achieved greater level of satisfaction for our clientele. It is due to his leadership qualities and business acumen that we have established a huge client base. We are the exporter in USA, Japan, Middle East and European Countries. Driven by an intense desire to attain maximum customer satisfaction, we have implemented customer-centric approach in our company. Our employees work in close proximity with our customers in order to understand their precise requirements. Once the requirements of our customers are known, the offered product range can be customized. Highly motivated to attain maximum customer satisfaction, our team of logistics professionals assures delivery of these products at the customers’ end within the stipulated time frame. Keeping in mind the convenience of our customers, we offer them easy modes of payment such as cash, online, credit card and invoice. Since the inception of our company, we have been backed by a state-of-the-art, ultra-modern and sophisticated infrastructure. Spread over a wide area of land, our infrastructure is divided into various units in order to ensure smooth and standardized operations. Our infrastructure is inclusive of manufacturing, warehousing, packaging, in-house quality testing and sales & marketing units. Equipped with advanced machinery, our manufacturing unit is upgraded as per latest technology at regular intervals of time. Our spacious warehousing and in-house quality testing unit has helped us in offering these canvas products in bulk quantities. Under the expert guidance of skilled workforce, we have been able to meet the bulk requirements of production in the most efficient manner. Our efficient manpower is carefully selected through thorough selection procedures after completely assessing their skills, knowledge and experience. Trained at regular intervals through workshops and seminars, our team comprises of skilled & semi-skilled labor, quality controllers, procurement agents, logistics professionals, production managers, warehousing experts, packaging professionals, sales & marketing experts and allied supporting staff. They are trained at regular intervals of time through seminars and workshops in order to enhance and polish their technical skills. Due to our ultra-modern infrastructure and a team of highly skilled professionals, we have been able to meet the bulk order requirements within the stipulated time constraints. Our customer-centric approach, which was implemented in our company since its inception, has helped us in gaining the trust of our valuable customers. Being a renowned organization, our team of quality controllers ensures that the optimum quality of our canvas products is never compromised with. For the timely delivery of the offered product range, we have developed a wide distribution network.